There are a few examples where research dissemination has engaged non-academic peers in peer review. Community Engaged Scholarship for Health “is a free, online mechanism for peer-reviewing, publishing and disseminating products of health-related community-engaged scholarship that are in forms other than journal articles.” If you have produced a product from your community engaged scholarship, CE4Health will peer review and post it. If you have written a paper about your scholarship, please find a journal to publish it. The editorial team is dominated by but is not exclusively academic and the peer review process includes one community and two academic reviewers. Manifestation: Journal of Community Engaged Research and Learning Partnerships “was an open-access, electronic, peer-reviewed journal dedicated to the conversations about how to most beneficially support and engage in community-based research, community-campus partnerships, service-learning, action research, and other inclusive methods and practices that build and empower our communities.” It was started by long time ResearchImpact friend, Peter Levesque Unfortunately, it was unable to keep going without funding. But that’s about it… thousands (literally) of academic, peer reviewed journals. Only three that I know of that have tried to redefine the concept of peer reviewer (if you know of others please comment and let me know… the ResearchImpact tweeps didn’t return anything new to me). If we’re going to redefine “peer” reviewers we need a new “peer” reviewed vehicle. One that will publish articles, stories, videos, poems, blogs and other forms of knowledge outputs from diverse forms of inquiry and diverse ways of knowing. But if we produce it will you contribute? We are professional knowledge brokers and allied knowledge workers. We are not faculty. We don’t have time protected for writing, reading, research and disseminating. We’re not measured on it either. If we produce it will you contribute? I am not promising we will produce it. ResearchImpact-RéseauImpactRecherche has this blog, our KMb in Action series and our videos. We broaden the reach of peer reviewed scholarship through our ResearchSnapshot clear language research summaries. Therein lays some of the creativity of knowledge mobilization. 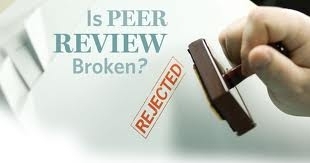 I am promising we will think about redefining “peers” and “peer review” (sometime). What will you do? Pingback: To Blog Or Not To Blog?